Proper communication is a critical component to successful rhinoplasty surgery. While most patients have a clear idea of what look they are trying to achieve it can be difficult to accurately convey this to their surgeon. Dr. Lamperti sees his role as your rhinoplasty surgeon as trying to attain as closely as possible your aesthetic goals. To do this accurately your goals must be fully understood, however. This is even the case if he doesn't fully agree with the chosen nasal shape; it is your face and you have the right to choose the nasal changes you want made to it. In other patients the ultimate rhinoplasty goal is less clear cut when they first arrive for their consultation. In this case they may look to the rhinoplasty surgeon for advice on what changes would look best. Even those with an initially strong opinion of what they want done may amend their preferences once they actually see the simulated nose on their face. The ability to preview a range of surgical results is quite powerful an indispensable. With the advent of digital photography and increasingly powerful computer imaging software allows patients to evaluate various simulated rhinoplasty changes and choose the nasal contour that best suits their aesthetic tastes and preferences. Patients are able to take part in "designing" their nose, providing input into the desired end result. When performed skillfully, the resulting morph is a realistic-looking image that enables both patient and surgeon to visualize the impact of specific cosmetic changes. Changes in nasal length, width and contour can be evaluated both separately and in combination. How does Computer simulation work? Computer simulation allows the surgeon to selectively morph various aspects of the nose while maintaining the original appearance of the rest of the face. An important question when it comes to computer morphing is how accurate are the results. This boils down mainly to surgeon experience and consistency of results but also to a thorough understanding of the computer simulation process. Dr. Lamperti performs all of his own computer morphing himself as he is the one who is best able to assess what results are truly possible in any individual patient's situation. 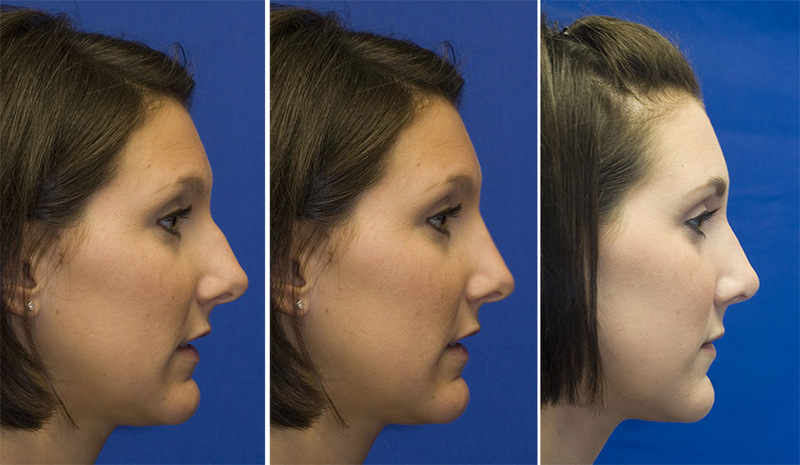 This is an example of a patient who Dr. Lamperti performed pre-operative rhinoplasty simulation to show her what type of results were possible with surgery. She has a significantly deviated nose toward the right as you can see on her preoperative photo on the far left. The middle photo shows her preoperative computer simulation and the far right photo shows her 13 month postoperative result. One can see a much straighter nose as compared with before surgery. On the patient's preoperative view on the left one can see a bump on the bridge and over-projected tip. The computer morphing simulation on the middle pane shows the proposed changes and the far right photo shows the 13 month postoperative result in which the patient has a straighter profile line, de-projected tip and reduced columellar show. Some surgeons produce overly ambitious computer morphings that, while aesthetically desirable, may be technically unrealistic or even surgically impossible! Therefore, a reputable surgeon will avoid simulations that depict surgically improbable or risky changes. Dr. Lamperti finds it vital to avoid overselling rhinoplasty surgery with unrealistic or deceptive computer imaging. Importantly, even a realistic digital simulation is difficult to replicate exactly in the operating room and no reputable surgeon will ever guarantee a specific surgical result. However, a final result that resembles the computer imaging is often attained in skillful hands, especially when the computer imaging is conducted in a conscientious and realistic manner.